Ever wonder what happens when owners go out and the pets are left alone? They put on a play! Naturally. In Animal Engine Theatre Company’s Dog Show, four enthusiastic dogs reassemble the basement and tell a story about love in farcical fashion. Dog Show basically tells you exactly what this comedy is. A show put on by dogs. Well, not actual dogs but people playing dogs. Like “Toy Story”, Dog Show follows a pack of house pets who have more fun when they’re left alone. When their owner is on a date upstairs, the dogs play pretend in the basement. The play the dogs put on is a farce about love triangles and mistaken identities. Oh and includes many dog related references. There’s no doubt that you’ll sit in the audience and scratch your head and wonder why. If the mission is fun, fun is what you’ll see. But there were some messy moments that hindered the theatricality. 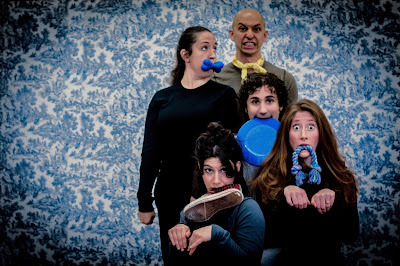 Dog Show's play within a play was intended to be a high-speed madcap farce with missed connections and misunderstandings. Perhaps due to wig and prop constraints, the pace didn’t reach the speed of comedy. Had the speed of comedy been achieved, the laughter would have been much larger. With performer Karim Muasher also serving as director, it may have been hard to ensure the farce necessities while he was focusing on acting. Adding a director to watch over and guide the quartet would have been of great aid. The ensemble discovered their inner animal and had such a great time doing so. They do a phenomenal job personifying dogs. Each actor had the great task of playing an assortment of characters, old and young, male and female, cross-gender and cross-species. This allowed for each actor to offer a variety of voices and physicality. Karim Muasher as Lightning, the lone male, portrayed the bulk of males including the laxative-taking husband who forgot his anniversary. Kudos to Muasher for staying in the dog crate during the preshow! Becca Benard as Thunder gets her hands dirty as the Elvis-inspired handyman but shines in the interludes rocking the keytar. Carrie Brown as Lady rocked the cone as one of her characters. Melinda Jean Ferraraccio as Shitsi was a highlight as the hotel clerk who popped up and checked in all the odd-couples into the same room. Dog Show is a fun concept but didn’t quite live up to the hype. What may have been funny in the rehearsal room did not translate as well on the stage.